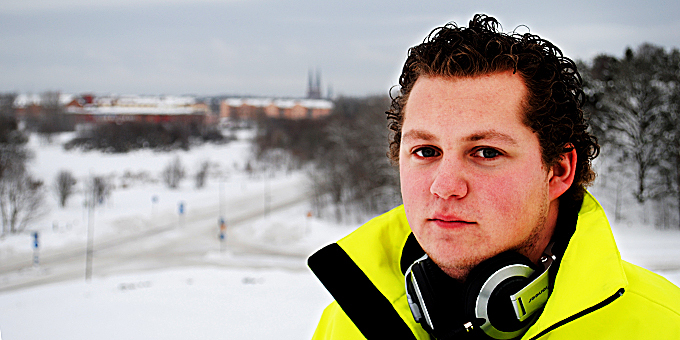 Peter Panda – Exclusive mix for bejbi.se. The 32:nd of our series of exclusive mixes..
Click ”see the rest of this entry” to read more about Peter Panda and to download the mix. In the midst of the Chinese jungle, there is a friendly panda. Making beautiful sounds. In the midst of Uppsala, in Sweden. There is another panda, making equally beautiful sounds but this time, using turntables. Peter Panda, a.k.a Peter Tapper has always been an eclectic musiclover. Growing up listening to mainly mainstream music, he found his love for DJing from hanging out with Future sound of Sweden resident DJ 2Bias/TrueNorth. Later when the urge for this type of music just became too much, he split the payment of his first set of turntables together with Dondale, also FSOS DJ. This DJ system was later sold for the benefit of his very own one. He started to spin them around and was completely hooked. The small suburb of Årsta would never sound the same again. Being a young, mysterious and up ‘n’ coming DJ, Mr Panda is looking to make people move their feet by the help of the soothing sounds of everything from tech trance to more uplifting vocal, equally dance inspiring, music. That was also the aim for this particular mix. It is aimed towards people who might not be familiar with this type of music, which is also a perfect reflection of Peter being a sincere crowd pleaser. This mix is a brilliant example of shooting at people of the ordinary kind. Is the fact that you never had understood the magic of electronic music, this is for you. You will come to see and hear a lot more of DJ Peter Panda in the future so consider this a first, an exclusive, a revolution. Now he is the 32:nd out for a series of exclusive mixes recorded for bejbi.se by our favorite dj´s, both well known, and unknown, that we will publish once a week untill we run dry. Download Peter Panda´s Exclusive mix here (right click and save as) or listen to it live on Soundcloud or just press play below here. If you want more of Peter Panda, check out his Facebook page.